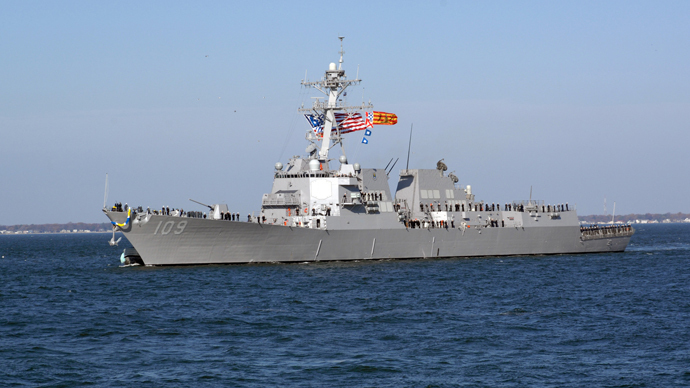 American destroyer USS Jason Dunham has crossed the Bosporus and entered the Black Sea, according to Russian military and diplomatic sources. The US Fleet previously announced it would support Operation Atlantic Resolve. The ship will reportedly stay in the Black Sea water zone until April 14, and it is expected to visit the Ukrainian port city of Odessa. “The American destroyer has completed the passing of the closed sea [the Bosporus] and entered the zone of the Black Sea,” a diplomatic source told RIA-Novosti on Friday. Jason Dunham is an Arleigh Burke-class guided-missile destroyer of the US Navy, introduced in year 2010. It is equipped with two missile launchers “Aegis” that are able to carry up to 56 “Tomahawk” cruise missiles. The ship with a 380-strong crew also has a group of two SH-60 “Sea Hawk” helicopters on board. At the beginning of March, six NATO warships participated in naval drills in the Black Sea. The operation, headed by the US, included anti-air and anti-submarine exercises. Moscow has repeatedly slammed NATO’s increased activity near the Russian borders. “NATO buildup on the eastern flank, or in the so-called ‘front-line countries,’ is an unprecedentedly dangerous step that violates all agreements, including the Russia-NATO Founding Act, which is still in force,” the ministry's spokesman, Alexander Lukashevich, said at a news conference.